I recently traveled to Jerusalem and enjoyed two book and writing-related meetings. It was a little sad to have to return home early and miss the goings on at the Jerusalem International Writers' Festival, which took place May 18th through the 23rd, and was "a week of conversations between Israeli and guest authors, panel discussion and workshops, literature and film including events for children and a celebration of the poet Yehuda Amichai, all hosted by Mishkenot Sha’ananim." My first stop was at Tmol Shilshom, a favorite cafe located in a courtyard near Jaffa Road. it was time to work out at the Writing Gym. Judy Labensohn served as trainer for this session, but she will be alternating with award-winning journalist Ilene Prusher in the weeks to come. What is a Writing Gym? It's where you give your imagination and your writing skills some exercise. Judy provided three writing prompts, and the group considered each topic and wrote - either by hand or on a computer. As someone who aspires to write, but never takes the time or gets sidetracked by the baskets of laundry, this was a welcome opportunity to get in the habit of writing something every day. Some of the participants read their work, and it was really interesting to see how different people approached the topic. From there I took the cross-town bus to Talpiot, where I met with Tzvi Maurer of Urim Publications. This publisher is mostly known for excellent non-fiction and biography, but I heard about a new work of fiction. 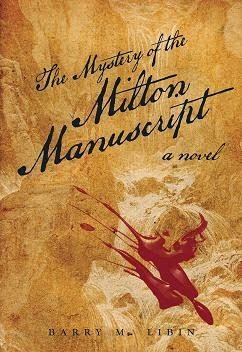 The Mystery of the Milton Manuscript by Barry M. Libin. It is "the story of Keith Jessup, a PhD student at Oxford, whose professor is murdered before delivering a lecture disclosing Milton’s own explanation of Paradise Lost. In his stead, Keith takes up the quest to find the Milton Manuscript and finally unravel the meaning of the epic poem. The scholarly hunt proves perilous as he discovers a plot to conceal the manuscript. Why? What could it contain that would spark such fear and murder over the centuries?" After seeing some "Real Cats of Israel," I returned home to my baskets of laundry.